You sense the pride immediately. 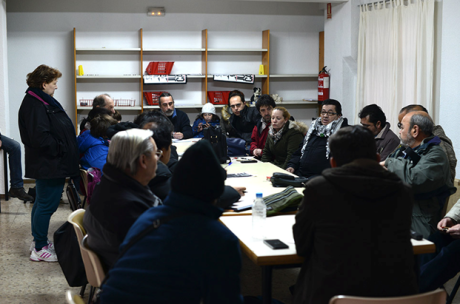 In meetings of Podemos ‘circles’ in the poorer neighbourhoods in the south of Madrid, many people are without work now. Some face eviction, as the local government increases rents and sells off pubic housing to private speculators. Despite the difficulties, the people are proud of being part of a movement to build a democratic and just Spain. They recognise that they are ‘the people’ and that they face a pitiless enemy - Spain’s elite; a corrupt fusion of left and right universally described as La Casta (the Caste). A Podemos circle meeting in Orcasitas, in the south of Madrid. Photo by Isabelle Merminod. All rights reserved.The discussion in the circles we visited was on different approaches to building a citizens’ movement against austerity; the difficulties of forming coalitions with left wing parties; how to build popular power; and the benefits and disadvantages of direct action compared to negotiation to stop the evictions. This pride is also there when you talk to elected Podemos people in the national or local citizens’ councils. But they are also a bit worried - the last year has been a wild year in which Podemos has grown extremely quickly. The structure is new. 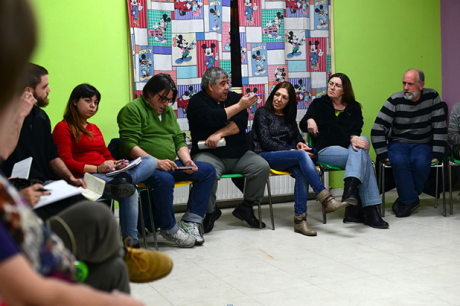 Podemos agreed basic documents in its citizens’ assembly at the end of 2014. People are volunteering time and money to keep Podemos going. There are elections in Andalucia this month, municipal and regional elections in May, and general elections at the end of 2015. At the same time, the number of Podemos ‘circles’ in Spain appears to be growing (now some 800). The circles fight alongside the social movements against austerity, evictions and privatisation. Podemos’ success challenges not only Europe’s elites but highlights the failure of Europe’s left to create a mass movement after years of economic crisis and suffering. Podemos rushed into the news in early 2014. Its leader, Pablo Iglesias, has a ponytail, is a professor of political science and speaks as if he was born to it. Spaniards have endured years of neo-liberalism and since the 2008 economic crisis, their government - whether left or right - has followed policies of austerity and cuts. 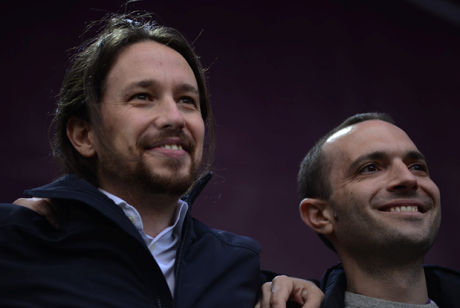 Pablo Iglesias and Luis Alegre at the Podemos rally on January 31, 2015. Photo by Isabelle Merminod. All rights reserved.In May 2014, just three months after registering, Podemos won 5 seats in the European elections with some 8% of the vote. Now, Podemos comes first in many polls and on January 31 they brought 300,000 people into Madrid’s main square, the Puerta del Sol. There are no ‘members’ in the traditional sense. No one pays a monthly ‘sub’ to ‘join’ Podemos; there are no ‘branches;’ unlike many other parties, activists decide their own involvement. You can become an ‘inscrito’ and vote; or you go along to your circle for discussions and organising. Or you can set up your own circle. Podemos’ structure is run by a citizen’s assembly which elects: a national citizen’s council, the secretary general and also an ethics committee. The ethics committee polices Podemos' representatives to ensure they follow Podemos’ ethical code. “The ethical document is… a charter which all of [those who stand for election] must sign,” says Laura Casielles member of the national citizens’ council. On the ground Podemos operates through ‘circles.’ But voting for representatives and policies is done through clicking on the Podemos website - you don’t have to be at a meeting to vote. So, for example, over 100,000 inscritos voted through the internet in the election for the Podemos general secretary last year. It was in 2011 in the Puerta del Sol that the famous Indignados started their sit-in, inspiring Occupy movements all over the world. In Spain, it converted into a grass roots movement - called 15M - which energised the existing action against privatisation, evictions, austerity and neo-liberalism. Podemos was born out of this movement. Podemos are the inheritors of the post Marxism of Ernesto Laclau, the Argentinian political philosopher. His theories deal with how elites use language and action to impose their ‘common sense’ and remain in power. But he has powerful insights into how to create an alternative language and alternative power. Podemos is also influenced by George Lakoff, the American linguistic scientist. Lakoff explains how the Republican right manipulates sub conscious ‘frames’ - which determine how we understand the world around us - in order to create a ‘common sense’ which supports the policies of the right. They do not use the category of ‘class’ at all. For Podemos the problem is the elite, a defective democracy and the absence of ‘the people’ as a political actor. Following Laclau they are trying to bring together ‘those from below’ with a common identity as ‘the people’ to build real democracy. They are creating a ‘common sense’, which actually reflects the reality of Spain - a corrupt elite manipulating democracy to force through policies, which destroy the lives of a divided people. 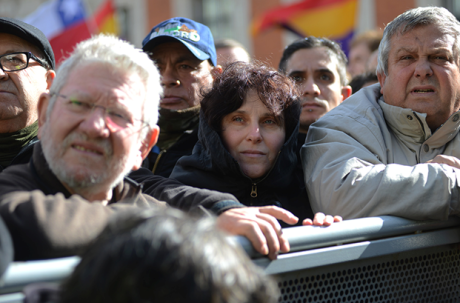 The language that Podemos is building reflects the break with tradition. As a measure of Podemos’ success, Spaniards are beginning to use Podemos’ words and language - not the neo liberal language of the corrupt elite. The most evident success is the word La Casta. Everyone - from newspaper editors to building workers - uses the word. Everyone knows that La Casta means the bipartisan neo liberals of the right wing Partido Popular (PP) and the Partido Socialista Obrero Español (PSOE) - shifting power back and forth between themselves. 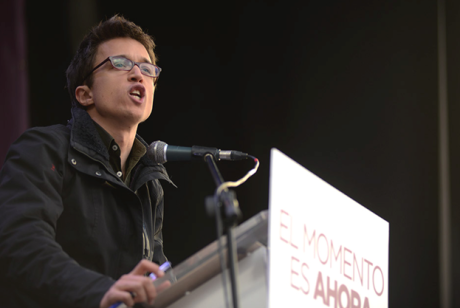 For example, in the Podemos demonstration held on 31 January, Iglesias used this language to build the identity of ‘the people’ against La Casta. He stressed the determination of the ‘the people,’ “How wonderful to see a people demanding social justice and democracy. It is a call to Spaniards, a call for sovereignty of citizens, a call aimed at uniting and creating the identity of ‘the people’ against La Casta. It was more Martin Luther King than Marx. “Without [social media] Podemos would never have existed… It was vital to Podemos,” says Nagua Alba, part of the networking team, pointing to another innovative approach of Podemos. She points out that there are neighbourhood, regional and sectorial circles. She reckons there are about 800 circles at present and she has a team of some 700 people she connects with - many of whom she has never met face to face. A Podemos circle meeting in San Fermin, the south of Madrid. Photo byIsabelle Merminod. All rights reserved.Alba says Podemos use Telegram (like WhatsApp) for internal communication meetings with the circles - some 200 people at a time. She says there is a constant conversation going on about problems, ideas and campaigns. For example, they work on creating a new Twitter campaign using Telegram. They use Mumble for large internal meetings. They are currently working to see if they can incorporate Instagram and Google + into their work. “The novelty of Podemos is that everyone can participate in the way they want to - you don’t have the classic militant who goes to meetings every day... not everyone can do this. Everyone can participate as they can - or want,” says Alba. She stresses that this level of participation would be impossible without social networks. Although Podemos has been very successful in a short time, of course there are still issues to be resolved. They include: how to fund the movement; the relationship between the circles, the citizens councils and leadership; the danger of an over-powerful charismatic leader; the party becoming ‘just like the rest’; and how to ensure that ecological and feminist language is part of a populist discourse. But the question remains; can Podemos’ political ideas, network strategy, populist language, and open democratic structures be applied to other countries in Europe - and elsewhere?